White Supremacists take note; African-Americans have the same love affair with the Second Amendment as you do. And more reason to cherish that right. After all, they were actually enslaved, you weren't. 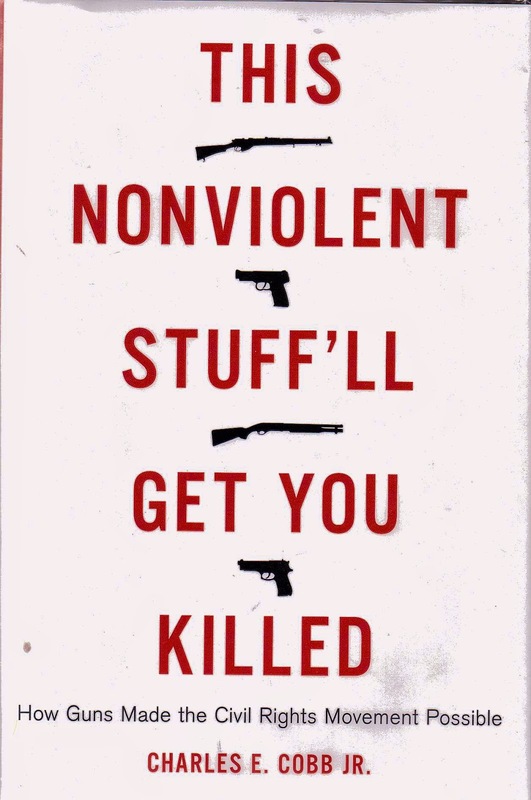 In this engaging little book the author has taken on the subject of just what part guns played in the non-violent movement for Civil Rights in the 1960’s. And you know what? Even Reverend Martin Luther King, Jr. kept a loaded pistol handy. Tracing the story of slavery and the early slave rebellions Mr. Cobb shows just how the mere specter of armed blacks sent cold fear up the spines of their owners. (What a nasty term to apply to another human being – owner!) This is also a book filled with heroes; the ones they never taught you about in school. These were the people behind the headlines; the ones who sheltered the Civil Rights workers from the north when they came down south to help secure the Right to Vote. Each chapter is filled with new names of ordinary people who; though down at the bottom the pecking order of a racist environment; managed to make not only make a difference, but also maintained some of their dignity in the process. How to explain the actions of old Mr. “Joe” McDonald who, after being shown the Constitution for the first time by the author, went into town and demanded that the sheriff return the shotgun which had been confiscated illegally. “I came to get my gun”, was what he said. When the sheriff told him he had no right to it, old Mr. Joe produced the book which the author had given him and said, “This here book says I do.” The startled sheriff returned the weapon without any further ado. The author also traces the relationship between slavery and the path of gun control in America. The first gun control law was passed in 1640 in Virginia and was aimed at keeping firearms out of the hands of slaves. Since Africans outnumbered the colonists this was of genuine concern. Have you ever seen the film “Mandigo”? This was a real fear to the plantation owners. African-Americans fighting in the American Revolution faced the hard choice of gambling on becoming free men if they worked for the British, or maybe becoming free men sometime in the future by working for Independence. Surprisingly few slaves actually went over to the British. But their participation in the fight for freedom did nothing to assuage their lot as slaves. As a matter of fact, with the passage of the new Constitution they were enshrined forever as less than whole human beings. But the best part of this book is the section which covers the African-American journey to freedom between the two World Wars and just after. The old song “How You Gonna Keep ‘em Down On the Farm” was never more applicable than it was for African-Americans returning from the First World War. Having been treated on a somewhat equal basis in Europe, the average black soldier was hard pressed to dampen his disappointment upon returning to the United Sates. He had fought for this country and half expected that sacrifice to be acknowledged. It wasn't. After the First World War the South seemed to double down on restrictions where African-Americans were concerned. Jim Crow became even tighter and lynching’s; which were never uncommon; increased. Night riding KKK members resurrected the old bed sheets and began a reign of terror against the African-American which would continue unabated for the next 50 years. I must note, here, that there is a common misconception which holds that the average African-American at the time did not consider the Second World War to be of concern to black folk. This belief is common to both black and white people, but the fact of the matter is that the Second World War was all about race; from genocide in Europe at the hands of the Germans, to enslavement in the Far East by the Japanese. Black folk had to have known that. And after fighting against racism abroad they expected some improvement back home. Moreover, they were now willing to fight for it. At the end of World War Two things really began to stir. In early 1946, in Columbia Tennessee, an ex-serviceman named James Stephenson, along with his mother Gladys, went to a department store to retrieve a radio which had been left for repair. The radio had been sold after 30 days, which was store policy. But the way in which they were treated and even beaten by store employees on the way out created an incident in which Stephenson; who had been a boxer in the Navy; knocked out a white man. The mother and son were arrested, but the arrests caused such outrage that they were released. But it didn't end there. Fearing reprisals the black residents of the town massed in the section known as the “Bottom” and organized a defense. Many of the men were ex-servicemen and all had rifles or shotguns in their homes. When the local riff-raff showed up, intent on violence, they got it. Caught between cars of sentries posted at both ends of town, the white intruders were allowed to enter and then escape under a withering fire of bullets. They didn’t bother to return. This was probably the beginning of the armed resistance to the outrages of Jim Crow. By 1949 this scene would be repeated in several locations; and nowhere more dramatically than in Monroe, North Carolina. Monroe was home to a returned serviceman named Robert Williams; no relation to me, unfortunately. I would be honored to have it so. After another black man in Monroe was beaten for needing a half day off work and asking for his pay, there was a fight and the man was convicted of murder for defending himself. He was executed in 1947. The KKK would not allow the townsfolk to have a funeral. They threatened the undertaker and anyone else who sought to simply bury the man, who was also a wounded ex-serviceman with a Purple Heart. At this point Mr. Williams began to organize the towns African-American citizens into a defense league. They surrounded the funeral home armed to the teeth. When the KKK showed up they were fired upon. Just as in Columbia, Tennessee, the KKK fled under a hail of bullets. Williams eventually became President of the local NAACP, over the objections of many other blacks, including Thurgood Marshall, who all considered him to be too radical. He was later exiled to Cuba, later returning home to America where he died in 1996. Rosa Parks gave the eulogy. The story of a man named C.O. Chin is so fascinating and inspiring that I will leave it to you to read the book if you want to know about him. He was a legend in Madison County, Mississippi and had land holdings, night clubs; including the famous Club Desire; and a thriving liquor business. He played an instrumental role in the early life of CORE. The Deacons for Defense and Justice, the SNCC, CORE and all the rest; even Martin Luther King; owe a great debt to the Second Amendment and the people who availed themselves of that right while living under great peril during the time of Jim Crow. Their stories are told here, some for the first time, by the author. This is a book which is long overdue, written by a man who was actually there with old Mr. Joe McDonald and showed him how to get his gun back. Until you have read this book you cannot have a complete understanding of what the Second Amendment meant to the Civil Rights movement. Simply put, this is a superb book.